The Fallout series has always been interested in creating a space for players to explore what they would do in a post-apocalyptic scenario. Would they build up communities, or blow them up? Fallout 4 is a departure for the series, though, as it is mainly focuses on mechanics and combat, rather than story and characters. Bethesda attempted to construct a themed world set in Boston. Many characters have a New England accent, you have the Minutemen trying to secure the area, and Fenway Park is a fortified settlement. There maybe some theming, but Bethesda really worked on making the game look and play better than previous installments. Fallout 4 is by far the most visually stunning game in the series, with player customization capabilities that allow people to create truly awe inspiring player characters. The combat mechanics were changed dramatically so that V.A.T.S. slows down time and not pause the game like it used to, the weapon customization is extremely in-depth, and the settlement system was an interesting experiment. That being said, it is as a result of spinning so many plates at the same time that Fallout 4 suffers from lacking a compelling story. The same was the case with Fallout 3, since Bethesda was trying to convert a isometric 3D series into a true 3D world. The makers were so concerned with making the game environment that they forgot to polish the story so that it wasn’t a basic tale. The focus on mechanics certainly helped to make Fallout 4 stand out from the rest of the series, but only in short bursts. Since the story was left by the wayside, many of the main factions were not engaging or particularly interesting. Anybody who worked with the Minutemen can attest to how poorly developed they were. The Brotherhood of Steel became techno-fascists with their vehement hatred of synths. The Railroad only exists as an opponent of the Institute and has no grand plan for the Commonwealth Wasteland once they freed the synths. This leaves the Institute as the only narratively intriguing faction to follow. Your son is a part of it, it has tech that far exceeds anyone else’s capabilities, and it legitimately has the best chance to save the Commonwealth. The only problem is that it’s creating a slave workforce without examining any of the obvious moral issues of doing so. This scenario is the rare instance in which the story practically forces you to side with the ostensible villains if you want to bring about the most good in the world. It’s interesting to play for a faction that does a lot of dubious things to save the world, though I like to imagine that once they take fully control of the Institute after the events of the game, my character would bring synth slavery to an end and have the Institute be the shining beacon on the hill. On the other hand, though, the game doesn’t give us a chance to set up this hypothetical ending, and it forces to walk down a murderous path that does not sit well with me. When there is only one faction that’s actually enticing to the player, you have an unbalanced narrative on your hands. I’m ok with factions having significant pros and cons so that it becomes difficult for players to choose who to side with. It’s one of the reasons I love Fallout: New Vegas so dang much, but that game had groups with fleshed-out backstories and quests. 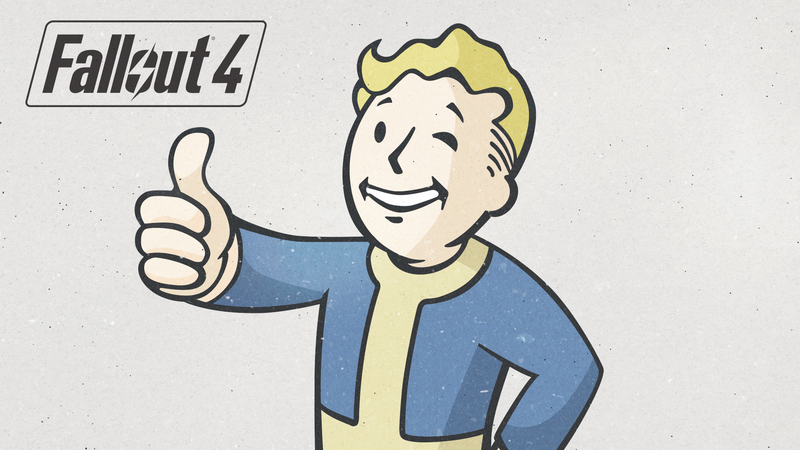 Fallout 4 doesn’t have these luxuries, and as a result feels narratively shallow. This shallowness truly comes through at the end when the final cutscene rolls. In most of the previous installments, there is a slideshow that not only tells you what happened to the wasteland based on which faction you backed, but also what happened to the settlements and communities that you encountered along the way. It’s a nice and tidy way to wrap up and put a bow on the story that you forged during your playthrough. What Fallout 4 gives instead is a choice of one of two videos that tell you nothing about your effect on the world. As a player, I felt cheated. Cheated of knowing that what I did was of any consequence. I spent an inordinate amount of time on this game helping the folks of the Commonwealth Wasteland, building settlements, eliminating grave threats to innocent people, and taking the time to learn about their backstories. I wanted to know what happened to them! I put my (virtual) life on the line for them, it’s only right that I should learn about their fates. This dearth of information stunts the world building of post-apocalyptic Boston, and renders it flat and boring. If everything that did didn’t actually matter, then what’s the point of doing anything outside of the main quest? The end isn’t the only place where the game fails to develop the narrative. As Patricia Hernandez wrote, so many opportunities to make the Commonwealth Wasteland unique were squandered. She pointed out the instance of your character encountering a robot “horse” race. Bethesda could have allowed you place bets or at the very least talk to the gamblers or staff members about the track or themselves. Instead, they start trying to kill you as soon as they spot you. What could have been a chance enrich the lore of the world is made into another shooting gallery. This happens over and over again throughout the world, and it’s makes everything a dull bloodbath. I get it; the wasteland is an unforgiving hellscape where it’s a constant struggle to survive. People die from thirst, hunger, and radiation on a daily basis. There are scores more that are horrifically murdered, beaten, or enslaved, making life an unending nightmare of atrocities for many. But even in these circumstances, especially in this weird alternate timeline, there is room for non sequiturs and silly things to brighten the mood. There needs to be relief from the massacres, the bullet maelstroms, the general malevolence, or you will wear down your players and lose their interest. Fallout 4 rarely attempts to take a break from the bleakness, and when it does, it fails to capitalize on them, and that just makes it a drag to play. In the end, it’s not that Fallout 4 is a bad game. It’s a great combat-based action game with RPG elements thrown in. The graphics are marvelous, the sound design and soundtrack are stupendous, and the main story is a classic one with an awesome twist. Where the game falls short, though, is its attempt to make an interesting world for players to explore. Some areas are better than others, but they all begin to blend together, losing any distinctive characteristics along the way. They all become shooting galleries, which shoots Fallout 4 in the foot. The Fallout series does rely on violence as a narrative tool, but your relationships with your companions and ties to the communities you encounter mattered just as much. Fallout 4 is just not concerned with either of those aspects, instead leaning hard into combat to make it work. That is not bad in of itself, but it lessens the Fallout franchise as a result. If it was condensed down to the size of a DLC, it could have worked well as an add-on to Fallout 3, but Bethesda made the mistake to bloat it up to a full game, and now it can’t stand on its own two feet.